When I first came to Belgium I got asked if I liked spaghetti. Like that. No other description. Coming from somewhere where spaghetti means the pasta, it was a weird question, because pasta on it’s own doesn’t have much flavor. So I asked what did they mean. And they meant spaghetti bolognese, or similar. A meaty sauce with vegetables and tomato. Skip the meat, and I’ll eat it, I said. So our veggie bolognese was born. It’s far from what an Italian would call ragú a la bolognese, so please don’t kill me. We really call it spaghetti now. Heat oil in a big pot. Add onion and garlic and cook on medium until golden. Add the bell pepper and cook for a few minutes, then add the carrot and stir through. Add the tomato pieces, the tomato concentrate and the minced quorn. Stir to combine. Add enough water to barely cover. Add turmeric, paprika, oregano, basil, soy sauce, and salt & pepper to taste. Bring to a simmer, and cook, stirring from time to time to make sure it doesn’t stick, for approximately 25 minutes. 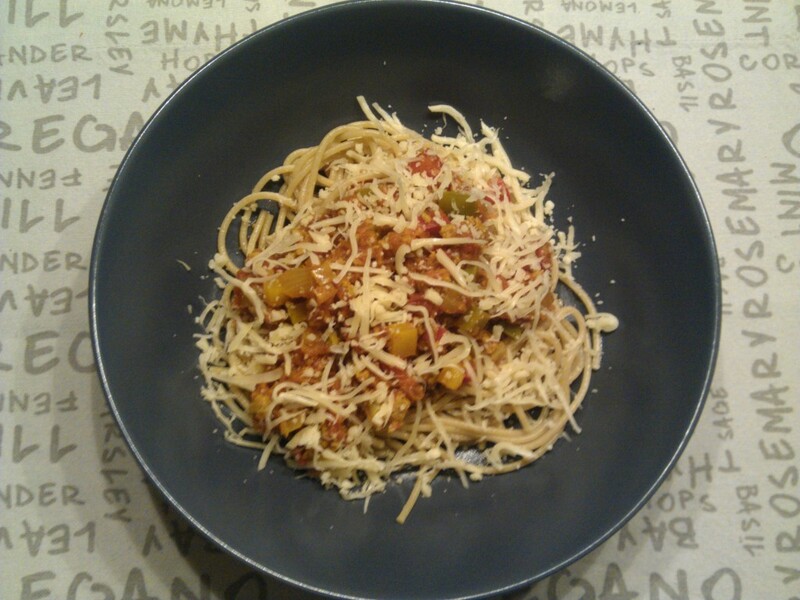 Taste, adjust seasoning, serve warm with spaghetti and grated cheese.